Nasogastric intubation is a medical process involving the insertion of a plastic tube (nasogastric tube or NG tube) through the nose, past the throat, and down into the stomach. Orogastric intubation is a similar process involving the insertion of a plastic tube (orogastric tube) through the mouth. A nasogastric tube is used for feeding and administering drugs and other oral agents such as activated charcoal. For drugs and for minimal quantities of liquid, a syringe is used for injection into the tube. For continuous feeding, a gravity based system is employed, with the solution placed higher than the patient's stomach. If accrued supervision is required for the feeding, the tube is often connected to an electronic pump which can control and measure the patient's intake and signal any interruption in the feeding. Nasogastric tubes may also be used as an aid in the treatment of life threatening eating disorders, especially if the patient is not compliant with eating. Nasogastric aspiration (suction) is the process of draining the stomach's contents via the tube. Nasogastric aspiration is mainly used to remove gastrointestinal secretions and swallowed air in patients with gastrointestinal obstructions. Nasogastric aspiration can also be used in poisoning situations when a potentially toxic liquid has been ingested, for preparation before surgery under anaesthesia, and to extract samples of gastric liquid for analysis. If the tube is to be used for continuous drainage, it is usually appended to a collector bag placed below the level of the patient's stomach; gravity empties the stomach's contents. It can also be appended to a suction system, however this method is often restricted to emergency situations, as the constant suction can easily damage the stomach's lining. In non-emergency situations, intermittent suction is often applied giving the benefits of suction without the untoward effects of damage to the stomach lining. Suction drainage is also used for patients who have undergone a pneumonectomy in order to prevent anesthesia-related vomiting and possible aspiration of any stomach contents. Such aspiration would represent a serious risk of complications to patients recovering from this surgery. Polyurethane NG tube (Viasys Corflo), 8 Fr × 36 in (91 cm). This fine bore tube is appropriate for longer use (up to 4 weeks). 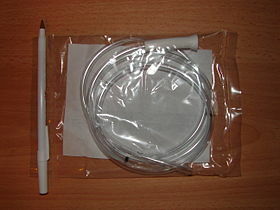 Levin catheter, which is a single lumen, small bore NG tube. It is more appropriate for administration of medication or nutrition. Salem Sump catheter, which is a large bore NG tube with double lumen. This avails for aspiration in one lumen, and venting in the other to reduce negative pressure and prevent gastric mucosa from being drawn into the catheter. Dobhoff tube, which is a small bore NG tube with a weight at the end intended to pull it by gravity during insertion. An endotracheal tube and nasogastric tube as seen on CXR. Both in good position. Before an NG tube is inserted, it must be measured from the tip of the patient's nose, loop around their ear and then down to roughly 5 cm below the xiphoid process. The tube is then marked at this level to ensure that the tube has been inserted far enough into the patient's stomach. Many commercially available stomach and duodenal tubes have several standard depth markings, for example 18" (46 cm), 22" (56 cm), 26" (66 cm) and 30" (76 cm) from distal end; infant feeding tubes often come with 1 cm depth markings. The end of a plastic tube is lubricated (local anesthetic, such as 2% xylocaine gel, may be used; in addition, nasal vasoconstrictor and/or anesthetic spray may be applied before the insertion) and inserted into one of the patient's anterior nares. Treatment with 2.0 mg of IV midazolam greatly reduces patient stress. The tube should be directed straight towards the back of the patient as it moves through the nasal cavity and down into the throat. When the tube enters the oropharynx and glides down the posterior pharyngeal wall, the patient may gag; in this situation the patient, if awake and alert, is asked to mimic swallowing or is given some water to sip through a straw, and the tube continues to be inserted as the patient swallows. Once the tube is past the pharynx and enters the esophagus, it is easily inserted down into the stomach. The tube must then be secured in place to prevent it from moving. Great care must be taken to ensure that the tube has not passed through the larynx into the trachea and down into the bronchi. The reliable method is to aspirate some fluid from the tube with a syringe. This fluid is then tested with pH paper (note not litmus paper) to determine the acidity of the fluid. If the pH is 4 or below then the tube is in the correct position. If this is not possible then correct verification of tube position is obtained with an X-ray of the chest/abdomen. This is the most reliable means of ensuring proper placement of an NG tube. The use of a chest x-ray to confirm position is the expected standard in the UK, with Dr/ physician review and confirmation. Future techniques may include measuring the concentration of enzymes such as trypsin, pepsin, and bilirubin to confirm the correct placement of the NG tube. As enzyme testing becomes more practical, allowing measurements to be taken quickly and cheaply at the bedside, this technique may be used in combination with pH testing as an effective, less harmful replacement of X-ray confirmation. If the tube is to remain in place then a tube position check is recommended before each feed and at least once per day. Only smaller diameter (12 Fr or less in adults) nasogastric tubes are appropriate for long-term feeding, so as to avoid irritation and erosion of the nasal mucosa. These tubes often have guidewires to facilitate insertion. If feeding is required for a longer period of time, other options, such as placement of a PEG tube, should be considered. Function of an NG tube properly placed and used for suction is maintained by flushing. This may be done by flushing small amounts of saline and air using a syringe or by flushing larger amounts of saline or water, and air, and then assessing for the air to circulate through one lumen of the tube, into the stomach, and out the other lumen. When these two techniques of flushing were compared, the latter was more effective. The use of nasogastric intubation is contraindicated in patients with moderate-to-severe neck and facial fractures due to the increased risk of airway obstruction or improper tube placement. Special attention is necessary during insertion under these circumstances in order to avoid undue trauma to the esophagus. There is also a greater risk to patients suffering from bleeding disorders, particularly those resulting from the distended sub-mucosal veins in the lower third of the esophagus known as esophageal varices which may be easily ruptured due to their friability and also in GERD. Alternative measures, such as an orogastric intubation, should be considered under these circumstances, or if the patient will be incapable of meeting their nutritional and caloric needs for an extended time period (usually >24 hours). Minor complications include nose bleeds, sinusitis, and a sore throat. Sometimes more significant complications occur including erosion of the nose where the tube is anchored, esophageal perforation, damage to a surgical anastomosis, pulmonary aspiration, a collapsed lung, or intracranial placement of the tube. ^ "Nutrition support for adults: oral nutrition support, enteral tube feeding and parenteral nutrition". NICE. August 2017. Retrieved 30 January 2018. ^ Section 82, Ensure Appropriate Position of the Dubhoff Tube Prior To Feeding. Betsy H. Allbee; Lisa Marcucci; Jeannie S. Garber; Monty Gross; Sheila Lambert; Ricky J. McCraw; Anthony D. Slonim; Teresa A. Slonim (28 March 2012). Avoiding Common Nursing Errors. Lippincott Williams & Wilkins. ISBN 978-1-4511-5324-8. ^ Manning, Chelsea Taylor; Buinewicz, Jacob Dillon; Sewatsky, Thomas Patrick; Zgonis, Evangelia; Gutierrez, Kathy; O'Keefe, Michael F.; Freeman, Kalev; Bird, Steven B. (July 2016). "Does Routine Midazolam Administration Prior to Nasogastric Tube Insertion in the Emergency Department Decrease Patients' Pain? (A Pilot Study)". Academic Emergency Medicine. 23 (7): 766–771. doi:10.1111/acem.12961. PMID 26990304. ^ Thomas, Bruce; Cummin, David; Falcone, Robert E. (24 October 1996). "Accidental Pneumothorax from a Nasogastric Tube". New England Journal of Medicine. 335 (17): 1325–1326. doi:10.1056/NEJM199610243351717. PMID 8992337. ^ "Confirmation of Nasogastric/Orogastric Tube (NGT/OGT) Placement". Cincinnati Children's Hospital Medical Center. August 22, 2011. ^ Perry, AG; Potter, PA (2010). "Skill 34-4: Inserting and maintaining a nasogastric tube for gastric decompression". In Ostendorf, W (ed.). Clinical Nursing Skills & Techniques (7th ed.). Mosby Elsevier. pp. 914–920. ISBN 978-0-323-06805-5. ^ Bani Hani, Murad; Ihim, Ikenna; Harps, Joyce; Cunningham, Steven C. (27 November 2015). "A breath of fresh air: a quality-improvement study comparing an air-circulating technique versus conventional technique to prevent nasogastric tube dysfunction". BMC Nursing. 14 (1). doi:10.1186/s12912-015-0111-9. PMC 4661948. PMID 26617465. This page was last edited on 24 March 2019, at 17:05 (UTC).